A U.S. spy satellite detected an Iranian ballistic missile test last week. The test of the anti-ship Fateh-110 Mod 3 flew over 100 miles on a flight path over the Strait of Hormuz to a test range in the Iranian desert, U.S. officials said on Aug. 10. It was conducted just days before the U.S. reimposed sanctions on Iran. 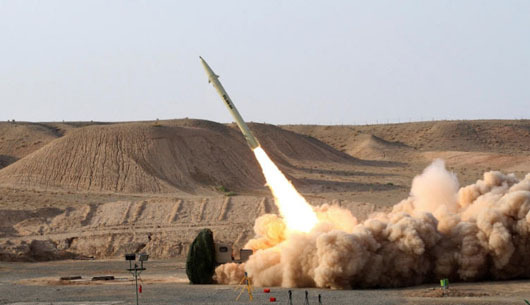 Iran had not test fired the Fateh-110 in over a year, officials say. “It was shore-to-shore,” a U.S. official who requested anonymity told Fox News. U.S. President Donald Trump said the new sanctions will target Iran’s access to American dollars and steel and automobile industries, ban trade with Iran in gold and other precious metals, and include other sanctions which were lifted under the 2015 nuclear deal. Additional sanctions will be imposed on Nov. 4, targeting Iran’s oil and shipping industries. The test coincided with a large-scale naval exercise by the Islamic Revolutionary Guard Corps (IRGC) which involved over 50 small gunboats in the Strait of Hormuz. Iran has threatened to shut down the strait, through which 30 percent of the world’s crude oil transits, if its oil exports are cut off. The missile launch is the first known test of the Fateh-110 in over a year. One of the missiles last year destroyed a floating barge roughly 155 miles away, two U.S. officials said at the time. The United States has imposed sanctions on Iran several times over the tests, saying Iran is violating UN resolutions. Iranian President Hassan Rouhani has vowed that the Islamic Republic will continue to produce missiles, saying they are for defense purposes only and are not a violation of international agreements. Meanwhile, Iranian Foreign Minister Mohammad Javad Zarif on Aug. 11 said Iran will not meet in the near future with the United States. Zarif said there also are no plans for a meeting with U.S. officials on the sidelines of the UN General Assembly in New York next month. Trump and Rouhani are scheduled to attend the assembly. Rouhani had said that Iran “always welcomed negotiations” but that the U.S. would have to rejoin the nuclear deal. “If you’re an enemy and you stab the other person with a knife and then you say you want negotiations, then the first thing you have to do is remove the knife,” Rouhani said.